In The Oxford Handbook of United Nations Peacekeeping Operations, editors Joachim A. Koops, Norrie MacQueen, Thierry Tardy and Paul D. Williams offer a major reference work that provides factual details and evaluations of each UN peacekeeping operation deployed up to 2013. Comprised of seventy-two chapters and over nine hundred pages in length, this is an invaluable study for scholars interested in the history and outcomes of peacekeeping, writes Gary Wilson. 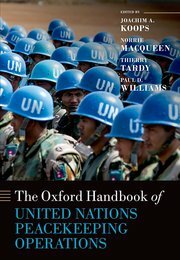 The Oxford Handbook of United Nations Peacekeeping Operations. Joachim A. Koops, Norrie MacQueen, Thierry Tardy and Paul D. Williams (eds). Oxford University Press. 2015. This volume is the latest offering from the Oxford Handbooks series, with similar publications already existing for the United Nations more broadly, the European Union, the World Trade Organisation, International Relations and Diplomacy. As with these other volumes, The Oxford Handbook of United Nations Peacekeeping Operations is intended to serve as a major reference work and totals some seventy-two chapters and in excess of nine hundred pages. The editors of the volume note in their introduction that ‘peacekeeping is arguably the most visible activity of the United Nations’. It is difficult to disagree with this assertion, making a major work that details the principles and aims of peacekeeping and explores their evolution through successive generations very welcome. The seventy-two chapters which comprise the volume have been written by a diverse array of contributors from a range of backgrounds and disciplines who collectively share an enormous wealth of experience and/or expertise in matters pertaining to UN peacekeeping. They include academics, diplomats and military officers. The book is structured into two distinct parts. Part One is titled ‘Concepts and Perspectives’, and consists of five chapters which explore some of the key thematic issues relevant to UN peacekeeping. Part Two comprises the bulk of the text, and for each UN peacekeeping operation up to 2013 a brief chapter summarising its main features and activities is provided. In Chapter One, Alex J. Bellamy and Paul D. Williams explore trends in peacekeeping operations from their first inception to the present day. Drawing on statistical data, they consider the locations in which peacekeeping operations have been deployed, the types of operations and their duration, and make comparisons between UN and non-UN operations. There is no express UN Charter basis for UN peacekeeping and in Chapter Two, Nigel D. White considers its status in international law, pinpointing the legal norms applicable to peacekeeping under UN auspices. The third chapter, by Joachim A. Koops and Thierry Tardy, is concerned with inter-organisational relations in peacekeeping processes. Although peacekeeping is most prominently associated with the UN, increasingly other organisations have come to undertake such functions – for example, the European Union, the African Union and NATO – and the challenges posed by these initiatives are given some attention here. In the next chapter, Thomas G. Weiss examines the humanitarian functions increasingly performed by peacekeeping operations, noting the need to maintain clear distinctions between the institutions of peacekeeping and humanitarian intervention, whilst acknowledging the impact of the ‘Responsibility to Protect’ doctrine on peacekeeping. The fifth chapter sees Paul F. Diehl and Daniel Druckman attempt to provide a framework against which the relative success of peacekeeping operations might be measured. Part Two’s systematic analysis of the sixty-seven UN peacekeeping operations created between 1948 and 2013 is broken down into four distinct historical periods, each preceded by a brief overview from the editors of the main themes and developments of the period in question. The first period covers the early years of the UN and spans from the creation of the United Nations Truce Supervision Organisation (UNTSO) in 1948 to that of the United Nations Yemen Observation Mission (UNYOM) in 1963. During this period, as the editors note, UN peacekeeping emerged as a significant but limited contribution to international efforts to maintain peace and security. The early operations were based on the core traditional principles of neutrality, consent to deployment on the part of the states upon whose territory the operations would be based and the non-use of force by peacekeepers other than in self-defence. This enabled peacekeeping to plug some of the gap caused by inactivity on the part of the UN due to the paralysis of the Security Council during the superpower struggle. The second distinct period covers the remainder of the Cold War era up until 1987. Relatively few new operations were created during this time, although peacekeeping became more institutionalised and some notable operations were nonetheless established, including the United Nations Peacekeeping Force in Cyprus (UNFICYP). This operation remains in place today, which perhaps speaks for its continued relevance, although it also reinforces the lack of any resolution to the situation that gave rise to its creation in the first place. The end of the Cold War brought a new wave of opportunities for the United Nations to make a greater contribution to the maintenance of international peace and security. The expansion of peacekeeping formed a key part of the UN’s post-Cold War agenda as operations undertook a broader range of functions and the traditional principles of peacekeeping were called into question. The period 1988-98 marked the third distinct period in the evolution of UN peacekeeping. Operations began to take on functions pertaining to peacebuilding and increasingly found themselves deployed to internal conflict situations. The perceived failings of UN peacekeeping in the likes of the former Yugoslavia, Somalia and Rwanda gave rise to a degree of disillusionment over the very promise of peacekeeping, and its use declined. However, a surge was witnessed in the final period identified by the book, 1999-2013, with a record 100,000 uniformed peacekeepers being in the field in 2010. The early twenty-first century saw peacekeeping undergo a major re-evaluation in the form of the Brahimi Report (2000). Modern peacekeeping mandates tend to be broad and often have civilian protection at their very core, a far cry from those earliest operations created during the UN’s infancy. This volume will be a much welcome addition to any library on the United Nations or related subjects. It will be of enormous use to scholars engaged in the study of peacekeeping, whether their perspectives are grounded in the disciplines of international law, international relations or defence studies, amongst others. It is eminently accessible while not neglecting to afford attention to some of the more difficult issues to have arisen in the context of UN peacekeeping. It serves two key objectives for the interested scholar in simultaneously providing critical analysis of some of the major themes and controversies inherent in UN peacekeeping practices, while also constituting a major source of reference for factual details of every operation to have been deployed over a period of 65 years. No reputable library should be without a copy. Dr Gary Wilson, Phd LLB (Hons. ), FHEA is Senior Lecturer in Law at Liverpool John Moores University. He specialises in collective security, the use of force and issues of secession and self-determination.